University of Phayao has its origin in the proposal of Naresuan University for an IT campus in Phayao province. The proposal was approved by the cabinet on 20 June 1995. According to the cabinet resolution dated 8 October 1996, the campus would be called “Phayao IT Campus”. Instructions and learning started in 1995. In 2007, President of Naresuan University (Associate Professor Dr. Mondhon Sanguansermsri) put forward the proposal to promote the campus into an independent university together with a proposal for the Royal Decree for University of Phayao. These were approved and declared in the Royal Gazette on 16 July 2010. 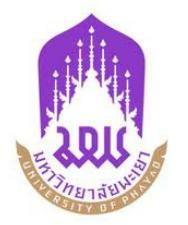 The Royal Decree for University of Phayao, officially delivering “University of Phayao”, took effect from 17 July 2010 onwards. In 2010, University of Phayao offered 62 Bachelor’s degree programs and 15 Master’s degree programs with the total of 11,363 undergraduate students, 582 postgraduate students and 1,027 university staff. In 2011, the total number of students is around 20,000. University of Phayao focuses on the development into a comprehensive university with the emphasis on the mission to produce quality graduates of international standards and on the development of body of knowledge to bring strength to the community and happiness to the society as well as to provide crucial foundations of national development for sustainable competitiveness in the world community. University of Phayao has the main mission to develop human resources of all levels in accordance with Thailand Qualifications Framework for Higher Education (TQF: HEd) with the emphasis on producing graduates who are complete with integrity, ethics, intellectual skills, interpersonal skills, responsibility, knowledge, and skills in numerical analysis, communication and information technology, so that they can work anywhere in the world. This is to be done simultaneously with the development of instructors’ potential and qualifications and the enhancement of academic standards. Future management of education promises a more diverse array of methodologies and formats. It is, therefore, necessary to promote a continuum of education of the target groups to include both the pre-labor market group and the one already in the labor market. This requires improvement of the instructional forms and methods, as well as revision of contents to keep pace with academic and professional advances. University of Phayao aims to promote Research and Development in order to bring about more complex forms of economic and social development; for example, research and development for modern industry that requires intellectual capital more than capitals of labor and raw materials, research to enhance the effectiveness of the use of resources and the restoration and preservation of the environment, industrial research, research in health sciences and the development of the public health service system, and social development research, etc. The university perceives the significance of this, and, therefore, emphasizes basic research in tandem with efficient applied research in different fields of study to bring about effective instructions and learning, higher quality of life and a long-term increase in the capability of true self-reliance. This calls for the development of research leaders who can operate in the environment of partnership and the encouragement of networking with well-known institutes both in and outside Thailand in order to precipitate the attainment of quality researchers of international standards. University of Phayao focuses on providing academic services in more diverse forms such as services for the development of education and quality of life and medical and public health services. In certain categories of services, the emphasis is put on educational institutes’ sources of income, especially services provided to target groups with high purchasing power such as those in the business and industrial sectors. There will also be considerations regarding investment collaborations with private sectors for certain types of academic services in order to arrive at specific goals. These collaborations will possibly be made with local government organizations in the upper-northern region and with private organizations in order to create strengths and to bring about acceptance from the general public. University of Phayao is committed to integrating cultures and participating in the economics of the world community. The promotion and preservation of art and culture in the Thai society provide a foundation for balanced development. This includes the study to understand the essence of being Thai in order to bring about the preservation of the differences in traditions and cultures and the uniqueness and dignity in living together in the world community. This can be done by promoting the desired culture and values and instill them in the individuals, organizations and society, making the promotion an important operative objective.